USS Peary reached Dutch-held island and stopped to refit and pick up supplies. Although the locals wanted the warship to remain, the officers insisted the ship’s presence would attract the Japanese and they had to follow order to finish the voyage to Australia. General MacArthur and his family came under bombardment and spent the day sheltering in defensive tunnels. 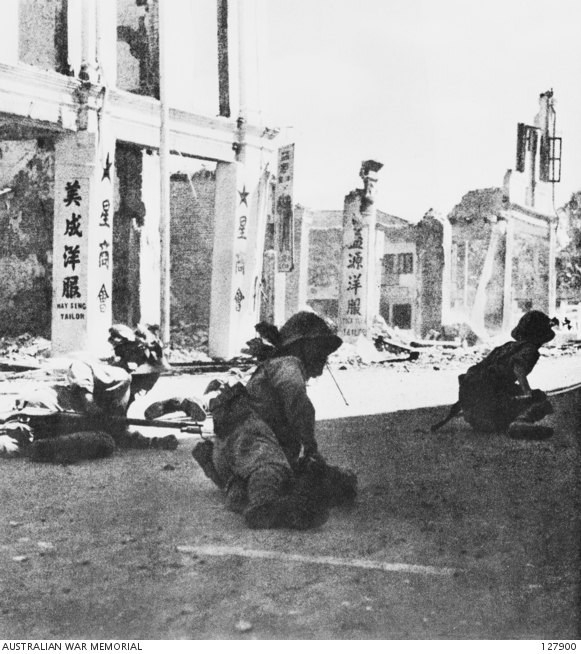 In Malaya, the Japanese captured British soldiers, airfields, and important towns. On the Eastern Front, German generals wanted to retreat after a successful Russian breakthrough; however, Hitler spent hours on the phone, relieving commanders and ordering his soldiers to stay in Russia as the winter worsened. Anthony Eden, returning to Britain after a stressful trip to the Soviet Union, was irritated that Churchill made all the headlines while his own diplomatic mission went nearly unmentioned. In North America, Prime Minister Churchill arrive in Ottawa and met with Canadian leaders; the issues with De Gaulle and other French leaders continued to be a hot topic that had to be handled delicately. The Japanese diplomats in Washington D.C. were relocated to a remote resort hotel in Virginia where they spent years under guard. German, Hungarian, and Italian diplomats and their families were also moved to similar accommodations. In Washington, British and American officials and military leaders met to discuss mobilization and war material out-put, working to create an agreement and plan to allow for more factory production. In the Philippines, President Quezon took the oath for his second term as President, repeating promises that American assistance was coming to fight back against the Japanese. Germany and Japan conflicted over natural resources, like oil and rubber that both wanted for war production. The staff at Hitler’s headquarters walked on proverbial eggshells as their commander became increasingly disturbed about the military situation in Russia and spent long hours on the phone, shouting at his generals. Still in Canada, Churchill received news that the British army could not hold Malaya or Singapore, but he kept the news to himself. Churchill’s speeches in Canada were well-received; he delivered the speeches in English and French and won the popular support. In Washington D.C. President Roosevelt hosted his final press conference of the year, carefully skirting overly controversial war issues and deferring some difficult questions to his State of Union address in January. Without tanks and artillery support, the British continued to retreat as the Japanese advanced rapidly in Malaya, using the major road system in the country. In Japan, high ranking officers studied the photographs taken during the Pearl Harbor attack and hoped to target San Francisco next. Germany and Japan made diplomatic efforts through their ambassadors to repair the shaky relations. 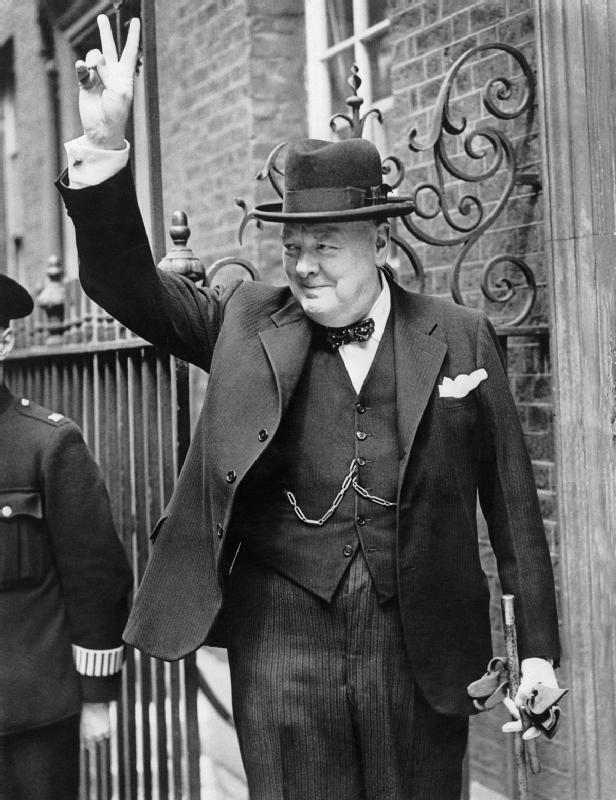 Churchill traveled back from Ottawa, enjoying the trip and making New Year’s quips and jokes. Hitler spent the day listening to recordings on his phonograph and agreeing to “step by step” withdrawals from Russia. Marshal Petain addressed the citizens of Vichy France, promising a bright future since they had made an agreement with the Germans. New Year’s Eve was celebrated very quietly at the White House, while across the United States a damper came to the holiday spirit. Air raid shelters and warning arrows lined Times Square. Wounded soldiers and sailors from Pearl Harbor finally arrived in San Francisco. 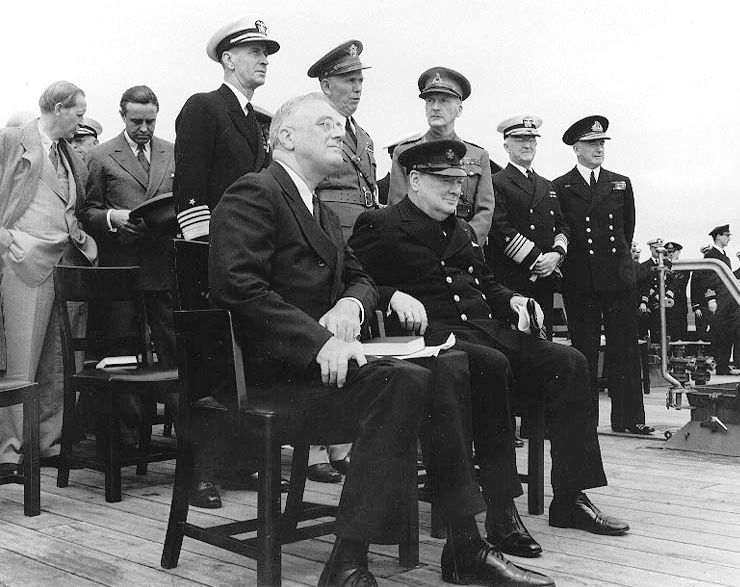 Roosevelt and Churchill in August 1941 when they prepared the initial outline for the War Aim’s document which was revised and then signed on January 1, 1942. The Japanese celebrated the new year, reflecting on their rapid successes and wondering how far the war would take them. The Allies were mobilizing and some commanders thought now was the time to make peace. American troops continued their retreat in the Philippines, taking position on the Bataan line which would not last long. USS Peary was attack by Japanese planes; the ship sunk and eighty-one seamen lost their lives. Hitler made a speech, trying to keep morale up his nation and promising victory no matter how long it took. Anthony Eden – back in England – had to report that Stalin was uncooperative and did not want any reduction of war material shipments, even though sending the ships to Russia was dangerous. Stalin, suspicious of the other Allies, basically started the Cold War relations by the beginning of 1942, wanting as much power and stuff from his supposed friends and unwilling to make ideological concessions, especially on Freedom of Religion. President Roosevelt and Prime Minister Churchill attended church together in Alexandria, Virginia, then drove down to Mount Vernon to place a wreath at George Washington’s tomb. The Joint Declaration of War Aims was signed at the White House in the afternoon, uniting the Allied cause, stating Four Freedoms, and laying the groundwork to charter the United Nations. The document was the product of some of the discussions, compromises, and decisions and was publicly shared. The other determined details remained closely guarded secrets for the military. 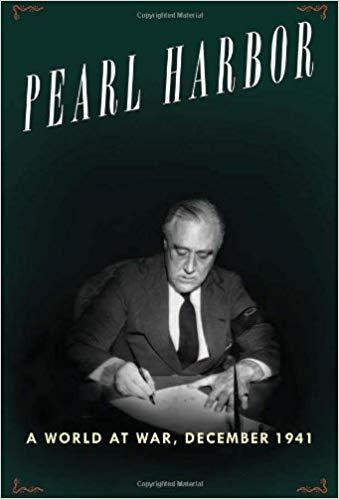 The United States was not yet ready for World War II, but it was in the conflict and had forged military, political, and international relationship plans that would serve as a basic road map through the next four years. Hmm…we’ll that’s a bit of a cliff-hanger. Want to know what happens next? It’s beyond the details and word count of this blog post, but you can pick up the rest of the rest of the history in our chapter notes from the World War II history book Inferno. Here’s the beginning of 1942 with the shipping/supply war and Russia in 1942. Follow up with details civilian’s war and the invasion of North Africa by the Allies. Find more Pacific War history here. I think to think of life as compartmentalized sometimes. For an hour, I’ll write blog posts. Then I’ll go work on chores. Then I’ll read for an hour. But – guess what – days don’t usually unfold that way. I’m trying to take that lesson and keep it in mind as I work on business plans for 2019. I can plan, plan, plan and there may still be something outside my control that messes with the schedule. As I’m thinking about my plans for the new year, these final chapters were especially interesting to read. Churchill and Roosevelt’s world did not reach a happy ending or even satisfactory conclusion at the end of 1941 and beginning of 1942. But they managed to accomplish what they needed to: establish a road map for Allied cooperation and military campaign plans to pursue. Sometimes, our years end with projects unfinished. Without the nice glittery bow to capstone the year. That has to be okay. We can learn from these world leaders to prioritize the most important decisions and build a roadmap for cooperation and success, not obsessing over every little details that will change and change before it’s finalized one week or six months from now anyway. Maybe the planning and preparing we see in the history books (in the midst of incredible stress and odds) will inspire you as you prepare for a new year – that will hopefully be much more peaceful than that world on New Year’s Day 1942. My book came today–luckily I saved all the posts, so I can sort of “read-along.” More lead time next, please?